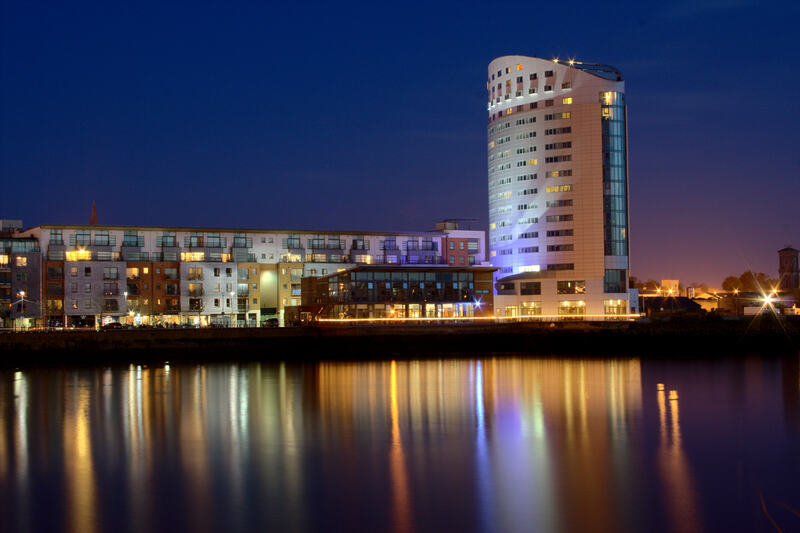 The Clayton Hotel Limerick, Irelands tallest hotel, is superbly located overlooking the famous River Shannon. 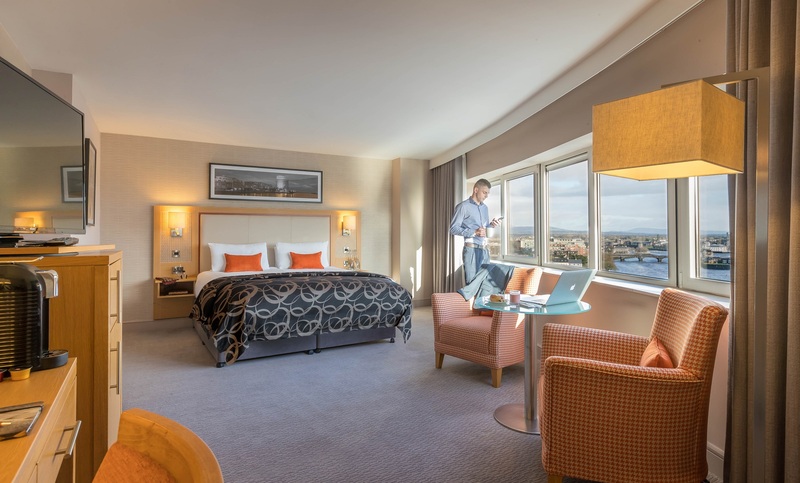 The hotel offers beautifully designed air-conditioned rooms overlooking Limerick city and the river Shannon with complimentary WIFI throughout. 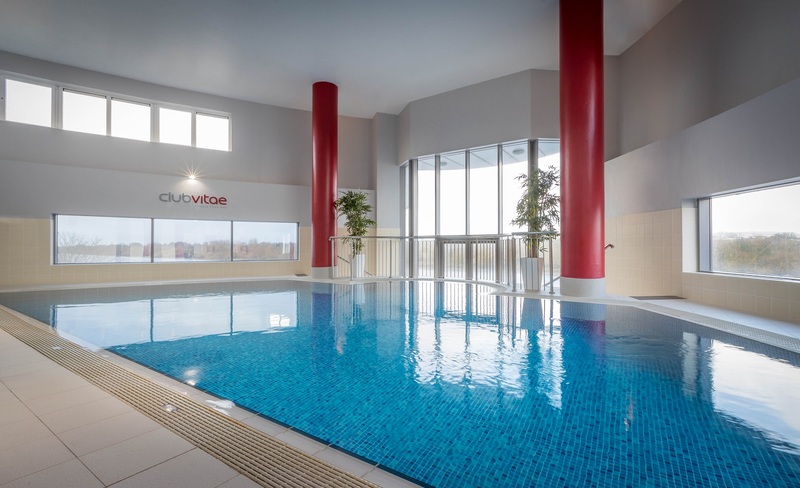 We are just a 5 minute stroll from the citys shopping and entertainment hot spots including to O'Connell Street, Thomond Park, tourist attractions, shops and nightlife all on the doorstep. We had a lovely stay on the Clayton. We had a beautiful view of the river and we were within walking distance of the pubs and restaurants which was great. Breakfast was nice and the staff were helpful and friendly. Only negatives are the liesure centre is a bit small and you have to pay and overnight fee for the parking. Overall 4/5 stars. Nice comfortable rooms , spacious and comfortable. Downstairs is the bar and dining area , not very comfortable , a bar you would not really want to stay long in , a separate more comfortable bar area would be better. Couldn't recommend this enough! On check-in the receptionist upgraded our room to a spacious superior with river view, robes, big flat screen TV, chocolates and a really comfy king-sized bed!! Great location, really helpful and friendly staff and super choice for breakfast. Amazing value for money... Thank You! This hotel was one of the best hotels that we have stayed in. The room was amazing with its wonderful views of the river Shannon from its floor to ceiling bay window. The bed was situated facing the bay window which gave the beautiful sight of the city lights at night and the daybreak of the river Shannon in the morning with its wildlife. The Staff were very helpful and really friendly, with Declan in particular, upgrading us to a superior/ deluxe room when we told him that we were down for our 24th Wedding anniversary. An overall brilliant experience and a definite return to the Clayton Limerick Hotel in the future. We couldn't fault it! I really enjoyed my stay in Clayton Hotel in Limerick. The hotel is within walking distance of the city. The hotel itself is very clean and the staff are extremely friendly. The food was excellent and I was delighted to be able to get a coffee and cake late in the evening. The pool area was good and very clean. In all I will definitely stay there again. Great location, magnificent view of the sunset over Shannon.Room was spotless.Staff very helpful and friendly.Would highly recommend. Everything was great.Hotel was clean, staff very helpful and friendly espically at reception Aoife and William andthe girls at kids club.Food was excellent. Great value for money.Will stay again. Great stay after a long day at an event. Bed was really comfortable only wish we could have had a longer stay. The staff were lovely and friendly. Location is close to city and has lovely views of the river. Room was done up recently bed comfortable room was clean. Things to improve on: Bar menu very limited with not a good selection especially at lunch. The pool was cold. Curtains don't cover the window (there was a corner window on 11th floor) so the sun came through in the morning. Car park across the road and its paid parking. This was a great hotel in a great location. The room was spacious and spotless and the staff were very friendly and helpful. We arrived late on Friday evening and our room was cleaned on Saturday even though we had hardly used the room. The variety of food for breakfast was excellent but the food could be a little warmer. The drink prices in the bar were very expensive. Overall I would definitely stay here again and would not hesitate to recommend this hotel to family and friends. Beautiful view from the 11th floor. Room was clean and basic enough. Breakfast was nice. Staff lovely and helpful. Lovely stay. Bathroom grout/bath sealer and window sill in room could do with maintenance ASAP. Always a pleasure to stay here been back many times and will return again! We were delighted with our stay. Room was really lovely with magnificent view. Food was delicious. Staff were exceptionally friendly. Lovely hotel, mod decor. If on floor above 9, try to take lift on the right as the lift on the left only goes to the 9th floor which means you have to take another lift to floors 10-15 from the 9th floor. (This was not explained to us by the receptionist, had to figure it out as on floor 12) Nice rooms but bathroom dated. No separate shower, low pressure, need to climb into bath in order to use shower. Breakfast good, self service except for tea/coffee. Car park off hotel E8.50 for a night. If possible, try to park elsewhere. My car was spray painted over-night. Signs indicate CCTV, but security advised me when I reported the incident that there is not cameras on all floors!!!!! Walking back at night to hotel bit creepy, walkway was lit up but not very bright. Better off to take a taxi. Perfect central hotel, great deal. Lovely Hotel, Clean and comfortable room, Friendly and informative staff, great selection at breakfast. Parking nearby and reasonable. Will stay again. We had a wonderful stay in Clarion. The staff were were wonderful, they even upgraded us when they heard we were celebrating my birthday. Highly recommended hotel, staff, facilities, with a special mention to Cody on reception who was extremely helpful. Very friendly staff, comfortable and clean room. Breakfast lovely. nice hotel beside the Shannon river. lovely food and great service. Rooms excellent. Breakfast quantity good, quality though was woeful. Badly needs to improve quality of breakfast, it was unedible. Good value stay. Room was very nice and clean well layed out. Id recommend a high floor room for very nice views. Dinner at the restaurant was okay,wouldnt go there again tho. Service in restaurant was slow at times. Hotel reception staff very friendly and eager to help u with any queries. thank to the clarion hotel for the lovely night stay on friday the 15 of july,from the moment we got there we felt at home.the staff were welcoming and friendly.we went to the pool had a swim and after had a meal and it was lovely.we went to the city for a few drinks and came back and had a night cap.the night porter chatted to us for awhile and was so friendly.5 star to all..
My wife and I stayed on a two night break with dinner each night the food and choice of menu was top class. The location of the hotel is very central to shopping and bars, and looks out on the shannon. We found the staff to be very helpful and friendly. We will be back again. Lovely hotel, great staff, real attention to detail. Have stayed here many times because of value for money and wonderful food. Very relaxing , well worth a visit. Fabulous break, staff very helpful, food excellent, very clean and would highly recommend. Only negative point is car parking is expensive. Spent a really enjoyable weekend at the clarion. Staff very efficient, friendly and professional. Kids club was a real bonus and my 7 year old loved it. Will definitely be back! Myself, partner and 2 children stayed in the hotel from Friday 25th till Monday 28 the of march. We were extremely disappointed and will not be staying again. The room itself was comfortable and the housekeeping staff were friendly and accommodating however that is where the positive experience ended. My daughter was on an antibiotic which had to be stored in a fridge however there was no fridge in the room and no way of securing a fridge for the room, instead we had to leave it in a communal fridge behind the reception desk which was not satisfactory given it was prescription medication to which any member of reception staff had access. The breakfast was not 4 star standard with the orange juice obviously from concentrate and not fresh and the choice was limited. The food in the bar was barely passable and if I were to guess I would say microwaved as opposed to cooked fresh. The primary focus of the food and beverage staff appeared to be ensuring food and beverage bills were paid immediately, so much so my partner was approached by the breakfast supervisor as just as he was biting into his sausage to pay 10euro for the children's breakfasts, that is very bad service and from our time time in the breakfast room we were not the only family approached in this manner. Overall I would describe the clarion as a hotel with comfortable bedrooms in a convenient location but very badly letdown by the aggressive payment focused culture of the staff which along with the poor standard of food leaves a very bad taste in the mouth and no inclination to return or recommend it in the future. We had a fabulous stay, although our kids ended up with a far bigger room that us!!! From check in to departure the hotel was amazing. Staff very efficient and extremely pleasant. Will be back. Lovely hotel, good location and great athmosphere in the Kudos bar. The swimming pool is disappointing though and it was also cold. Hotel room was lovely and spaciousness. The good in kudos bar as part of the b&b& evening meal was absolutely gorgeous served by a very nice friendly chap called Noel. Breakfast was also lovey. Only down side is the size and temperature of the swimming pool. There were prob 5 families in in and it was packed, no room to swim and it was very cold.. Other than that we as a family of four had a lovely time here. it was ok hotel.3-4 star facility. breakfast good,leisure center was alright, Fantastic view. Will book the hotel again in the future.